Oct. 21, 2014 - As the end of 2014 looms, eyes in the Canadian forestry sector are turning towards the planned renewal of the Softwood Lumber Agreement (SLA). It expires in October 2015, and it’s safe to say there is no one on this side of the border who doesn’t want a renewal of some sort. In the United States, demand for lumber has long exceeded what domestic mills can supply, and the construction industry has therefore depended on imported wood products. But, over the past 25 years, the U.S. lumber industry has frequently sought U.S. government restrictions on Canadian softwood lumber imports because it felt the industry had an unfair competitive edge. It sought the application of countervailing duty laws and antidumping laws. Canada succeeded in challenging these actions through the dispute resolution mechanisms of the World Trade Organization and NAFTA. But, meanwhile, Canada’s forestry sector suffered. To prevent further squabbles and associated losses, the SLA came about in 2006, allowing Canada to apply charges and/or volume restraints on Canadian softwood lumber exports to the U.S. and prohibiting the U.S. from launching disputes. The SLA had a seven-year term, and it saw the return of more than $5 billion in duty deposits by U.S. authorities to Canadian companies. The SLA continues to do its job this year. On March 26, the London Court of International Arbitration (LCIA) ruled in favour of Canada in a dispute over the termination date of export charges related to a 2011 decision under the SLA. The Quebec Forest Industry Council (QFIC) and the Ontario Forest Industries Association were “delighted.” They stated in a press release the next day that “The application of export charges following the ruling…in 2011 considerably hampered softwood lumber exports from Quebec and Ontario. By acknowledging this fact, the LCIA has confirmed that the forest industry of central Canada had already paid its penalty and there were no longer any grounds for collecting these export charges.” Under the ruling, exporters from Quebec and Ontario had had to pay additional export charges of 2.6 per cent and 0.1 per cent, respectively, on top of the charges provided for under the SLA. In 2013, the government of Quebec prepared for this SLA renewal by radically revising its stumpage system to make it more market-oriented and to satisfy the U.S. that Quebec sawmills are not benefiting from illegal subsidies. QFIC president and CEO André Tremblay believes the stumpage revision should satisfy the U.S. fully because the U.S. has long demanded that provincial stumpage should be based on auctions, and Québec now has an auction-based pricing system. “One need only compare lost jobs in Québec to lost jobs in the Atlantic Provinces (exempted from the SLA) and the west to recognize the SLA’s impact…There can be no doubt about the adverse impact of the SLA on the Québec industry, although we recognize that the global recession contributed significantly to a decline in North American demand, that was felt with particular severity by the Québec industry,” Tremblay explains. 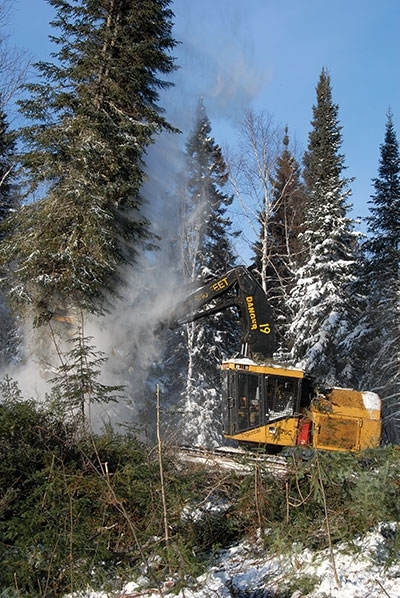 He says the new Québec stumpage system already has raised costs to the Québec industry between 15 and 20 per cent, and if the SLA is renewed “as is” (without recognition of these changes), it will cost the province’s forest industry thousands more jobs in years to come. The company stated that it strongly supports the SLA for the way it provides stability and predictability of U.S. market access: “Thanks to the SLA, lumber exports are free of export tax or quotas today and for the majority of the past year, resulting in a resurgence of exports from Ontario, and notably, Quebec.” Paul Krabbe, Tembec’s vice president of special projects (Forestry) confirms that the company supports the SLA renewal on its current terms. An “as is” renewal of the SLA is also supported by Council of Forest Industries (COFI, which represents 11 B.C. forest industry firms). In the view of COFI President and CEO James Gorman, the Canadian softwood lumber industry is “united” in its support for the federal government’s position, and that it was closely consulted in developing the SLA renewal mandate.